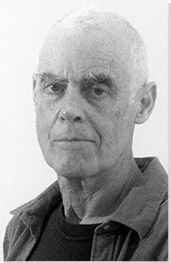 The below artworks are the most important by Richard Long - that both overview the major creative periods, and highlight the greatest achievements by the artist. Artwork description & Analysis: This piece is a straight line in the grass, a path-like impression made through the act of simply walking. Long transforms the landscape into his personal canvas, pacing repeatedly over an unremarkable patch of grass in a London park until a distinct line appeared. The artist then documented this alternation with a photograph, which he took at a perpendicular angle so his trace can be easily seen. The resulting work is part performance, part sculpture, and part photograph, transcending these categories to create a piece that exists in all these categories. Incorporating elements of performance into the sculpture and preserving the work through photography, his process was as much about the resulting photograph as the sculpture was about expressing the journey and the event of walking. Made while still a student at St Martin's School of Art in London, Long broke with the expectations of sculpture and demonstrated that an impermanent mark in nature could be a meaningful gesture. Part of the emerging Conceptual art movement, the importance of the work shifted from the creation of an object to the fulfillment of an idea, or simply the ideation of an art action. The photograph creates a tangible marker of this action, but the piece itself was a temporary intervention in the landscape, quickly erased by the natural processes of growth and regeneration. In this simple act of walking, Long expands the definition of art to include ordinary, but mindful, interventions that may or may not result in any lasting visual object; this would be highly influential in the rejection of Pop art. Pop had broken from the traditional expectations of artistic originality and highbrow subject matter and technique; Long proposes another path for artistic exploration by highlighting the materials and processes of the natural world. Where Pop had focused on the consumable object, Long's work deemphasized the art object in favor of a performance or an idea. Long's work returns to more mystical notions of artistic creation, although he conveys these ideas through minimalist means: here, the line shows an exertion of energy and human intentionality. In this sense, it serves as a highly conceptual exploration of the transience of time, distance, and place, but presents these ideas in a very grounded and physical landscape. Artwork description & Analysis: This work was executed directly onto the wall, painted with actual mud that Long transported from his hometown of Bristol to the museum in Ontario, Canada. Echoing his performances in the natural world, he then used his body to create the mud marks on the wall, applying the mud with his bare hands and preserving the smudges of his fingertips and handprints on the wall. The process of his painting remains highly visible, revealing a repeated motion that suggests patterning amongst the loose and splattered effects that extend beyond the sphere. Through simple, bare gestures, Long creates an intricate pattern; working with the humblest materials, he creates an object of nearly hypnotic beauty. This piece balances order and disorder, containing chaotic and expressive mud painting within in a perfect circle. Expanding on the gestural chaos of Abstract Expressionism, Long moves his work further from traditional definitions of art by rejecting art materials or permanency. His process, working directly on the surface of the wall, creates a work that is site-specific and impossible to move or preserve indefinitely. When his mud circles are included in museum exhibitions, they are uniquely created by the artist, and are simply removed and painted over at the show's end. And yet, while temporary, this series of mud circles also have a timeless quality that connects them to the beginning of artistic creation; the application of mud onto the gallery wall recalls the earliest human impulse to create. The piece is reminiscent of early cave painting, bound to its surface, indelibly connected to the site of its creation and yet suggesting a cosmic or spiritual dimension. The desire to leave a mark is a basic part of our existence. Long creates a work that is very elemental in both material and shape. Artwork description & Analysis: Installed on the gallery floor, this sculpture is comprised of a ring of red rocks, arranged precisely to create a four-meter wide circle. Long collected the rocks from an area near the state border between Vermont and New York, bringing them into the space of the gallery to create his own landscape. He cut the rocks smoothly and flatly on the bottom while leaving the remainder of their structure untouched and jagged so that they point upwards in a jarring and irregular manner, recalling the rugged origins of the red slate being quarried from the earth. He retains the natural look of rocks split by organic processes, but accomplishes this through the painstaking work of leveling the unseen surfaces. 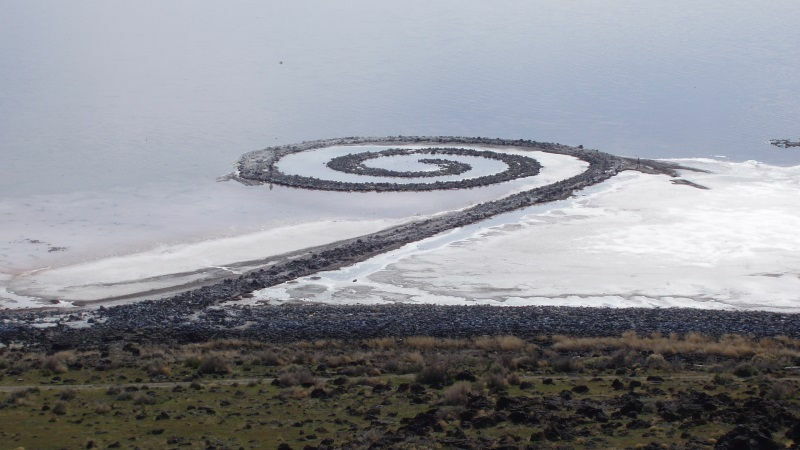 While Long's work with natural materials aligns him with the Land Art movement, his repetitive, reductive gestures and simple gestalt forms connect him to Post-Minimalism. The circle created here is easily understood as a whole, despite his insistence of retaining the distinct identity of each piece. Through Long's careful placement, the rocks fit carefully together, yet no two touch, highlighting not just the shape created, but the negative space between each component. The result is both one single unit and an assemblage of individual parts. We can also read this distinctness as a sign of respect to the material in its most natural state. Since the rocks do not touch, the viewer is asked to consider each individual rock as a sculpture unto itself. Artwork description & Analysis: This lithograph and screen print, which measuring 189.50 cm high, stands roughly the size of a man and catalogues a series of experiences noted during a sixty-minute walk. The number 60 runs throughout the piece, which features 60 lines of texts and was then reproduced into 60 prints. With this repetition, Long draws our attention to the temporal quality of this walk, presenting us with one descriptive word or phrase for every minute of his journey, describing what he saw, heard, felt, and did. The letters sit atop a black and gray background which Long created by applying ink onto the surface directly with his fingertips. Against this minimal background, each line contains only one to three words, making the text long and narrow as if the words are walking down the original path in Big Bend, Texas. Long experiments here with a different process of recording his actions; rather than photograph the walk, he wrote a poem and then presented that poem in a way that recalls the physical experience of the original in simple terms. The words are concise and the background of the poem is a monochromatic, gestural expression. Yet, the artwork still remains conceptual, as the audience can never fully envision the actual event and is left with only the poetic fragments. Artwork description & Analysis: This site-specific wall painting was commissioned for the opening of the Tate Modern. Installed over a gallery wall, Long painted a large rectangular swath of black paint over which he slung a mixture of white china river mud and water, rubbing and wiping the material with fluid movements to create a swirling pattern. The application appears chaotic, yet patterns emerge, suggesting some underlying order or logic. The fervor and intensity in which he added the mud is suggested by streaks that run down the wall, leaving energetic lines that evoke the elements: leaves falling in the wind, or a strong rainstorm. There is a meditative quality to Long's use of natural materials that connects him with the Land Art movement, but the relatively intimate scale of wall paintings such as this, and his continued interest in creating work for gallery or museums spaces differentiates him from some of the more physically ambitious monuments of Land Art. His use of delicate natural materials suggests nature's fragile beauty rather than what we can do to manipulate it. Artwork description & Analysis: Waterlines is a line drawing made in nature. Long created two broad, snaking lines extending from a riverbank in the Warli Tribal Land of Maharashtra, India, reaching into the landscape towards fields and trees. He then photographed the result; the final photographic work includes the two lines and also two figures in the distant background. The inclusion of these figures emphasizes the composed nature of the photograph as a work of art, not simply evidence to document the performative event. Long acted as a conduit, replicating the natural manner in which water creates lines upon the landscape. With this simple gesture, which leaves no permanent mark or trace, he questions the role of the artist and minimal boundaries of defining art. Here, the work is a gestural mark upon the landscape, an ephemeral sign of human existence left in the most unobtrusive way possible. The work is destined to vanish and the photograph alerts the viewer to this passage of time, as one can only imagine the short life of the two lines baking on the rock in the hot Indian sun. First published on 19 Dec 2016. Updated and modified regularly.